You are here > Home > Uncategorized > How does CHASA use your donations? 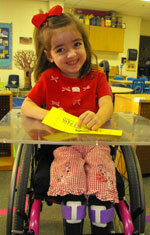 Your donations directly help families of children who have hemiplegia or pediatric stroke. You may donate to CHASA using PayPal, our online donation system at Crowdrise, or by check. Learn more about donating here. CHASA Hosts Over 50 Online Groups: It’s hard to take this journey alone and parents tell us the groups are valuable sources of support and information. Foot Orthotic and Hand Splint Grants: These grants provide financial assistance to the family of a child who needs a foot brace or hand splint. Research Support: Support of researchers who are investigating hemiplegia and pediatric stroke and treatment of related disabilities. CHASA assists researchers in locating participants for research studies. CHASA is not currently funding research. CHASA Family Retreat and Retreat Scholarships: This gathering of families of children who have hemiplegia provides an opportunity for attendees to visit with experts to learn about the most current information on medical, therapeutic, and educational issues. There is also the opportunity for parents and children to meet and visit with other families who have been affected by hemiplegia. This importance of this popular event can be summed up by the words of an eight year old girl who has hemiplegia, “I know that I’m not alone. There are other kids just like me.” Your donations underwrite some of the expenses of this event and also provide scholarships for families. Young Adult Retreat: CHASA hosted the first Young Adult Retreat in July 2017. Young adults from across the United States and Canada attended and make lasting connections and friendships. The next Young Adult Retreat will be hosted by CHASA in the summer of 2019. College and Vocational School Scholarships: These scholarships are available for students who have hemiplegia or pediatric stroke. Athletic Scholarships: These scholarships are available for students who have hemiplegia or pediatric stroke. Education: Development of informational fact sheets, awareness and early identification of stroke brochures, websites, medical conferences, speaker programs, and other means of providing families, the public, and the medical community with information about hemiplegia and pediatric stroke. Weekends for Moms: After surveying moms of kids with hemiplegia, the CHASA board wondered how we could help moms relax and take a break. CHASA helps set up weekends away where moms can enjoy some relaxing time with other women who understand the challenges they face as they parent a child with a chronic illness. CHASA Local Support Groups: CHASA facilitates connections between parents in a number of locations. Parents who live near one another may choose to set up a local support group. CHASA supports these groups with funding for activities. Pediatric Stroke Awareness: CHASA parents created the first Pediatric Stroke Awareness Day in 2002 and continue to lead the pediatric stroke awareness initiative as well as supporting general disability awareness. Below, you’ll find programs CHASA has funded in the past. Currently, they are not being funded, but may return to a funding cycle in the future. To learn more about how CHASA has helped families since 1996, read Our History. CHASA Cares! CHASA will send one of our cute Kandu penguins to a child with hemiplegia or pediatric stroke who is having a difficult time or celebrating a success. These children might be in the hospital, facing medical tests or maybe being bullied at school. Or, they may have learned to tie their shoes with one hand, learned a new adaptive sport, or succeeded in reaching a personal dream. CHASA has given penguins to over 250 children and our shipment of 250 additional penguins just arrived. Donate and help us continue this program! Regional Family Reunions: We took a break from our annual retreat in 2015 and CHASA added regional family meetups to allow even more families to meet others who are on this same journey. CHASA set up hotels, volunteers staffed these reunions and families reported that they enjoyed meeting others.